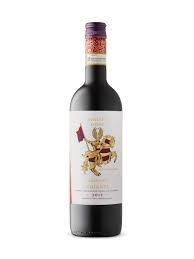 Cavaliere d’Oro is Treasury Wine Estates’ new Italian line, which features a portfolio designed to bring wines from various regions of Italy under a single brand. This Chianti is sold under the Gabbiano trademark, the iconic, Treasury-owned brand that is the #1 selling Chianti (by volume) in the U.S.
How does this new offering differ from the basic Gabbiano? It’s a very close cousin, but a bit more richness in the mid-palate, accomplished by adding 10% Merlot to the blend. It is a classic Chianti with the trademark sour cherry and baked earth aromas but supplemented with a pleasant licorice or anise note. On the lighter side of medium bodied, the palate is spare but juicy with an acid-driven finish which pushes out a citrus-like note as the fruit fades. The tannins are soft but with the angular acidity provide some rusticity familiar to Chianti lovers. At a slightly higher price than the basic Gabbiano, it offers a bit more flavor and softness without sacrificing character. Nothing revelatory but If you’re a fan of cheap Chianti it is surely worth a try. The sour acidity of cheap Chianti always brings to mind twangy country guitars and fiddles. Dwight Yoakam’s Guitars and Cadillacs keeps me hangin’ on.